Blast Off, Junes program of the month, is a simple game that tests your typing skills. 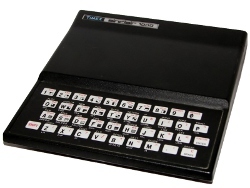 You may find it a bit easier to play on an emulator than on a real ZX81. Fortunately, you can try now! It isn't a very hard game if you are decent typist. It would also work well for those practicing their typing skills. Blast Off is a simple program that displays your goal and a line of 32 letters. Blast Off highlights each letter for you to key in. Once you've keyed it in, the program replaces the letter with an *. If you key in all the letters correctly, you win! If not, well you dont launch and have to start over. 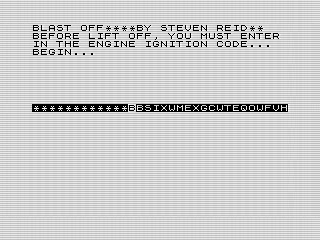 The program has a timer on each letter that runs a bit faster each correct letter entered. Sometimes the simplest programs are the best. Enjoy ... until next month!